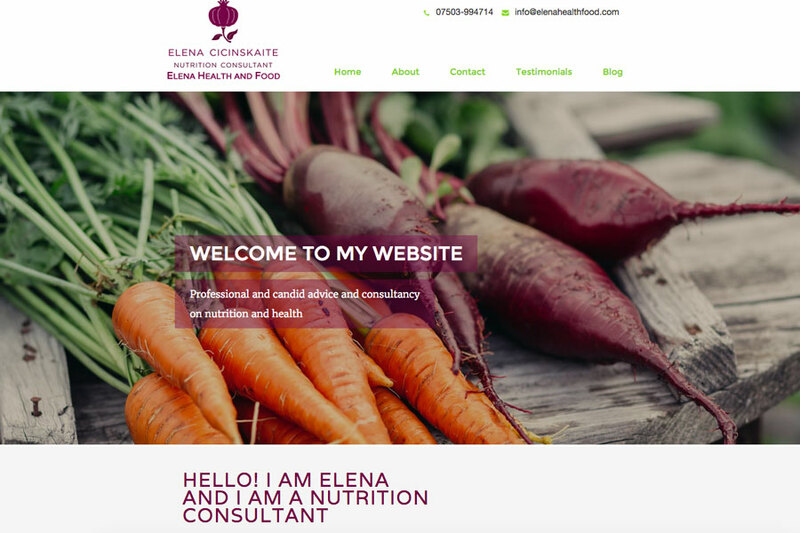 This week's website of the week goes to Elena, Health and Food. Elena offers professional and candid advice and consultancy on nutrition and health. Senior Project Manager Lanara started by creating a fully responsive website, using full width panels, a slide show header and box style layout on the home page to showcase what Elena does in a visual and appealing way. The website features a purple colour taken from the clients existing branding, and used as an accent colour throughout. Because the images are very colourful the rest of the design is a fresh white so that the content and imagery stands out. The website features a Google Map which is great for portraying your business location or an area that you cover. Google My Business is a powerful tool when it comes to SEO too. The website is a five page website. Each page is different with a header image, and relevant text to the title of the page. The imagery works well at breaking up blocks of text and makes it flow easily. The website passes Google's mobile-friendly test with flying colours, meaning that the website is responsive to the device it's being viewed on. This is a must when it comes to people viewing the website on the go! Your clients will want to be able to access your website from whatever device or browser that they like, so responsive design is essential. It is important to choose imagery that compliments the design and that are representative of the services provided. A mixture of well selected stock imagery and the clients own images create a brilliant end result.